I have my Arrow Lip-Sync finished! I started this project with a soundtrack, a stage set-up, and some camerawork. I added some effects… and NOW it’s time for the animation! … but first… the lip-sync! My Arrow lip-sync took me, like I said, at least eight hours of careful, not-quite tedious work… about 3000 frames of my 3900-frame animation. When I felt that it WAS getting tedious, that “I couldn’t TAKE IT anymore!”, I would “save” and quit, and try, again, tomorrow. … Then, at the start of that next session, I would review and enjoy and, maybe, fine-tune, my previous work as inspiration to get back into it, again… maybe do a Render to AVI to see how it is looking. It doesn’t sound like it… but I enjoy doing the lip-sync. It’s really fun to see the model mouthing the words as I progress through the animation. 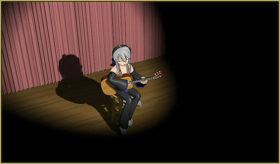 I like to do the lip-sync as a separate MMD animation… separate from the actual “dance” animation. I want to have the model’s face clearly in view with no distracting elements in the way of my concentration… and, yes, lip-sync work takes PLENTY of concentration! Two, even three, sliders at a time! 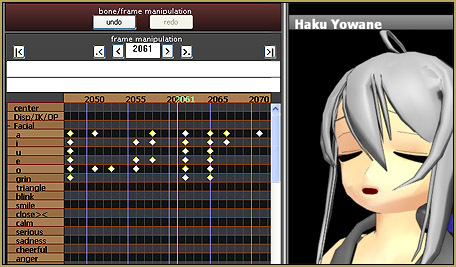 I used to recommend doing lip-sync using only one or two sliders at a time… because it used to be all I could do to keep track of ’em… but this animation needed some subtle mouth-action and I felt limited by the few slider-options available to me; this Haku model is pretty simple! … so I did employ several sliders at once to get “just the shape” I was looking for. … with or without the applause! 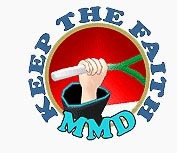 I have saved my lip-sync motion as a .VMD file… and I have saved my soundtrack as an Mp3. You can download them. Included is the soundtrack Mp3 WITHOUT the applause, in case you don’t want the applause. Finally… I can start the animation!